FlowMotion One is a highly versatile smartphone stabiliser that allows you to capture super-smooth cinematic videos. EGGS has helped implement this first-rate fusion of product design and technology innovation by providing expertise in esthetics, ergonomics, colour material finish, production and project strategy. This is a consumer electronics Kickstarter project that recently set a new Norwegian crowdfunding record with over one million US Dollars pledged. Out of 118,000 crowdfunded projects, only 211 have raised over one million US Dollars - placing FlowMotion in the top 0,2% of most successful Kickstarter projects to date. Capturing smooth, non-shaky videos via your smartphone is often nigh on impossible, especially if what you’re filming is happening at speed. That mind-boggling bunny hop your buddy just did on his bike for instance just becomes a frustrating-to-watch mishmash of jerky footage when you play it back - in other words, downright disappointing. The design process has been a close collaboration between the team at Flowmotion and EGGS product designer Martin Skogholt. EGGS has worked in close collaboration with FlowMotion from the get-go - starting with product design mentoring, and then as an enabler and team member. Martin Skogholt has been our lead product designer on the project, and is also a sponsored snowboarder. Not only was he able to offer his skills in product design and pool resources with FlowMotion’s own in-house product designers, he was perfectly suited to intuitively understand the target market too - being a potential user himself. Thus FlowMotion became a dream team of dynamic designers, business developers and fellow sports enthusiasts. 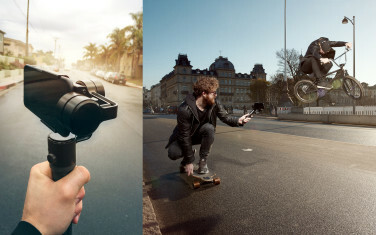 What FlowMotion and EGGS have developed is a state-of-the-art stabilizing grip that anyone can quickly whip out of their pocket or bag, and easily attach to their smartphone to film fast-paced action with absolute clarity. Having initially written their masters in Crowdfunding at NTNU (Norwegian University of Science and Technology) in Trondheim, FlowMotion has been pretty nifty at getting people to rave and write about FlowMotion ONE. From its offices in Norway, and now Palo Alto in California, FlowMotion presents a unified mindset of effective marketing, branding, profiling, communication and product design. 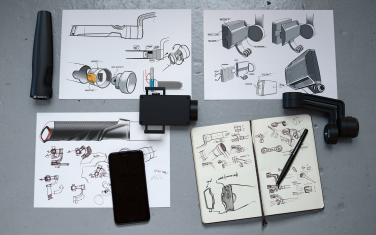 Consequently, it's drummed up considerable financial support - FlowMotion ONE is the most rapidly rising Kickstarter project for a Norwegian company ever. Who said slow and steady wins the race? More like fast and steady! FlowMotion One is pocket size and weighs only 300g. It uses advanced auto follow technology - keeping its focus on the subject marked in the frame and following every movement.